You read our review HERE. 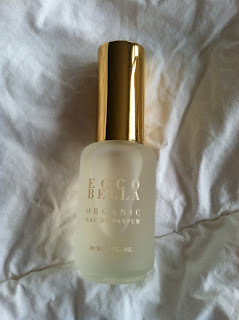 Now it is your chance to own your own delicious Organic Vanilla Bourbon Parfum from Eco Bella! I like Ecco Mist Lavender. Organic Vanilla Herbal Body Lotion sounds good! I would like to try the Organic Vanilla Herbal Body Lotion. The natural night rebuilder cream sounds great. Natural Dark Chocolate Face Mask. i would like to try the natural dark chocolate face mask! anything vanilla is my favorite like the organic vanilla lotion sounds wonderful. Their Good For You lipgloss looks awesome! Thank you! I like the Natural and Organic Vanilla Hair Conditioner. I like the FlowerColor Eyeshadow in Smokey Mauve, Sapphire, and Earth. Thanks for the giveaway. the Organic Grapefruit Herbal Body Lotion sounds fantastic! I would like to try the eyeliner pencils. I would also like to try the Natural and Organic Hair and Scalp Therapy Shampoo with Green Tea and Neem from the site. Yo Gabba Gabba at the STL Fox Theater! St. Louis Science Center Holidazed Camps! Lelli Kelly for all yout Tween Shoe Needs! Sesame Street Live in St. Louis!